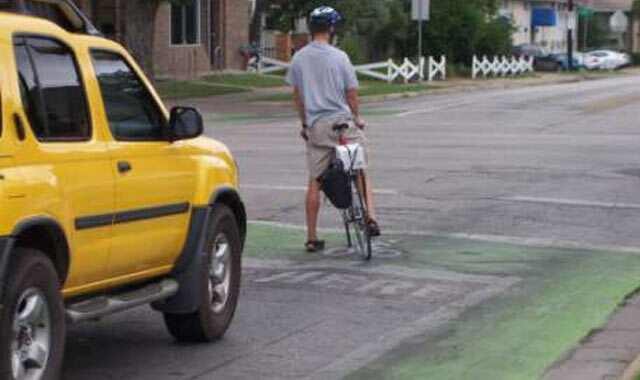 In 2009, as part of an experiment coordinated between the Austin Street Smarts Task Force and the University of Texas’ Center for Transportation Research Center in 2010, the city of Austin installed bike boxes at two intersections on multi-lane roadways to study their effect on bicyclist and motorist behaviors. Three conditions were studied using before and after video footage: before the installation of the bike box, after the installation of a “skeleton” bike box, and after the introduction of color to the bike box. 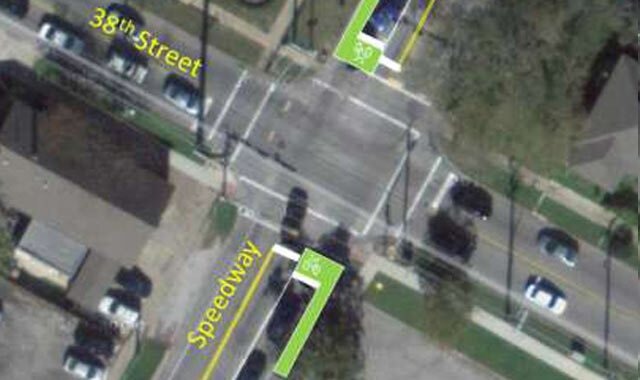 At the intersection of Speedway and 38th St., along a common commuter route for students to the University of Texas, bike boxes were installed on both sides of the intersection at 38th St. Speedway has a posted speed limit of 25 mph and hourly traffic volumes ranging from 150 to 250 vehicles. The results of the study showed a decrease in avoidance maneuvers, an increase in the percentage of cyclists that departed the intersection before a motorist, and an increase in the number of bicyclists that used the bicycle lane to approach the intersection. The addition of a chartreuse thermoplastic color to the bike box further deterred the encroachment of vehicles into the bike box and increased the use and visibility of the treatment. Overall, cyclists took a more predictable position at the intersection and were more likely to depart safely in front of motorists. Brady, J., Mills, A., Loskorn, J., Duthie, j., Machemehl, R., Center for Transportation Research. (2010). 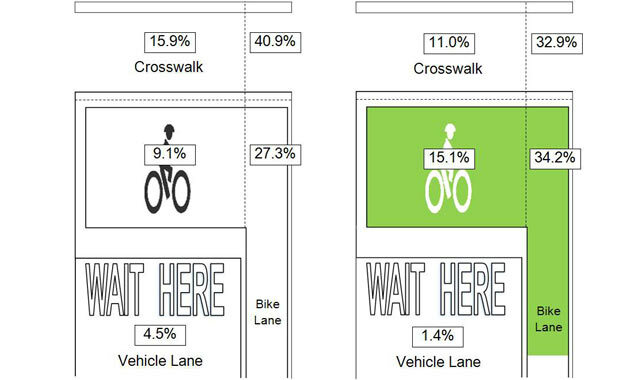 Effects of Bicycle Boxes on Bicyclist and Motorist Behavior at Intersections. City of Austin.